The Papertrey Ink Anniversary Celebration starts today and it is a doosie of a day! If you have not been by there yet, hurry on over. One of the things that I love best about Papertrey Ink is the people who illustrate and design their releases and those who style them in ways I would never dreamed of doing. With an amazing design team, superior product quality, and unsurpassed color lines, if I was challenged to live on a desert island, they would be my “consumables” lifeline. In celebration of their 5th anniversary, each of design team members listed her top five products. Here is a card I made for my Mom, who loves Jane Austen as much as her daughters, using some of those favorite products: kraft cardstock, rosie posie stamp (as an addition to the Jane paper in the diecut frame), and the woodgrain impression plate. 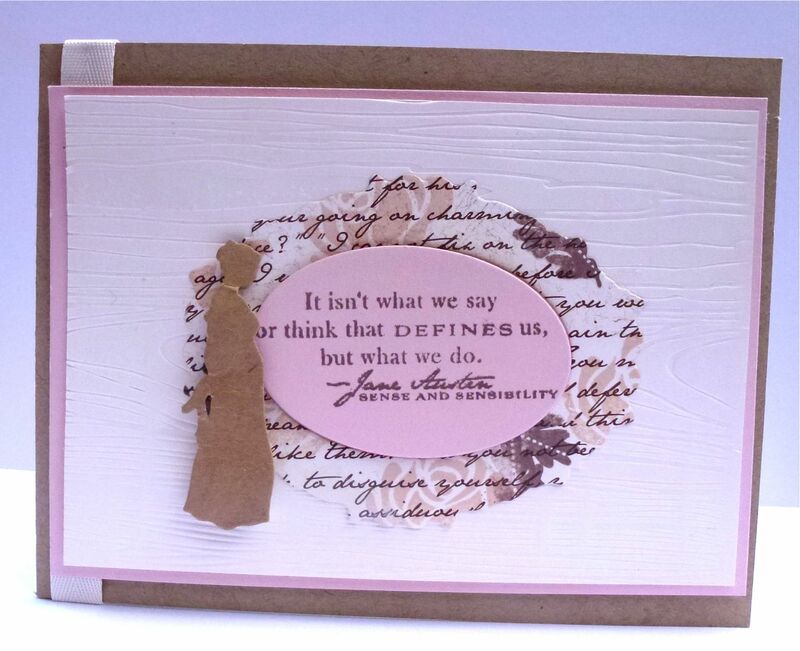 The rest of the stamping and die cut are from the Simply Jane line. I am a novice stamper – and a card without a Cricut cut is a new thing, indeed – but I kind of like being able to put one in the mail without extra postage from hand cancelling or the card size. I’ll be back again soon with a Cricut project. This is absolutely lovely! The colors and textures compliment one another perfectly and capture spirit of the project. Your mom will love this! She has to love having such artistic and expressive daughters. Beautiful card! And look at the latest card I posted on my blog because I think you’ll crack up :D. Mine is not elegant though! Lovely card with thoughtful sentiment. Words to use to start a beautiful day. What a beautiful card…love the sentiment…I can feel the calm when I look at it. I just ordered this stamp set. My favorite line of all time is Mr. Darcy saying how he loves Jane most ardently. Makes me swoon. So this set is a must have for me.